APICS Principles of Operations Management is an education-based program made up of five courses designed to help new entrants to the field of operations management establish the foundational knowledge necessary to excel in the fields of production and distribution management. Principles offers organizations an efficient and effective approach to educate and develop professionals on the basics of operations management. When facing a specific educational need within your organization, customers can fully customize their Principles program to build courses to meet these needs. Organizations can select Principles course sessions, suitable as stand-alone minicourses or to be combined with other sessions, to create a customized learning experience. 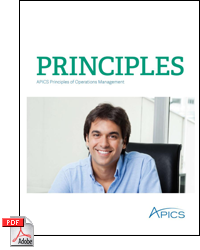 The APICS Principles of Operations Management consists of five classroom-based, instructor-led courses. The Principles of Inventory Management course provides participants with an operational knowledge and understanding of inventory management principles and techniques. The Principles of Manufacturing Control course details priority and capacity management through the use of material requirements planning (MRP), capacity management, capacity requirements planning (CRP) and other techniques. The class will explore the execution of the production plan and master production schedule, reactions to capacity constraints, and maintenance of individual order control. The Principles of Operations Planning course teaches participants the principals of effective planning used at each level in the planning process, from strategic to operational. The course provides practical examples and exercises, giving students a chance to practice and enhance their own planning skills. The Fundamentals of Operations Management course provides the overall understanding of how a company converts a “customer desire” to a completed product or service. Each company function is discussed and its role and responsibilities are covered to provide successful strategies to overcome difficulties. “Lean Operations” overview is provided. The Principles of Distribution and Logistics course introduces the foundations of planning and control in distribution and logistics. Among the topics discussed are the basics of logistics management, the principles and activities of warehousing, the principles and activities of transportation, fulfillment, the concept of supply chain management (SCM), and the principles, functions, and application of distribution requirements planning (DRP). Though discussion and problem solving participants will learn about the role of logistics and supply chain management and participate in distribution priority and capacity planning techniques. If you are interested in Principles classes, please contact us.